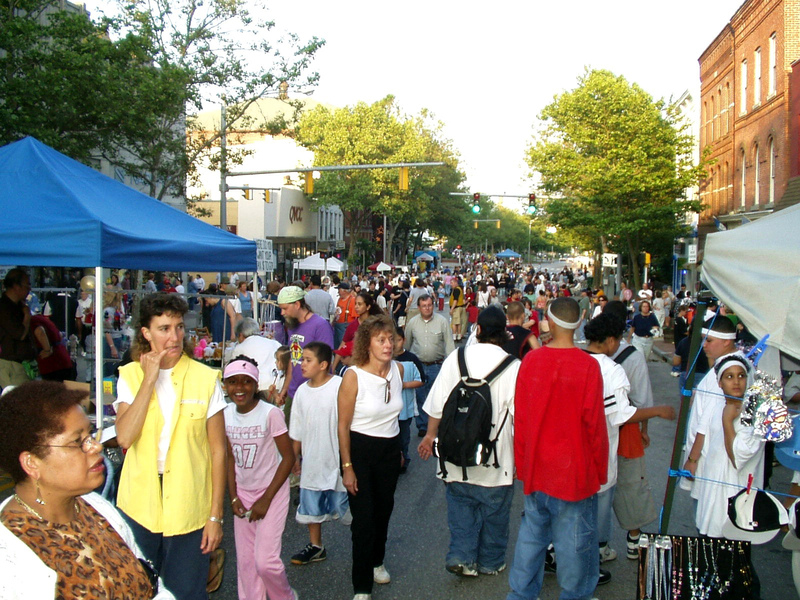 A street festival that features music, theater, food, and local and regional vendors. 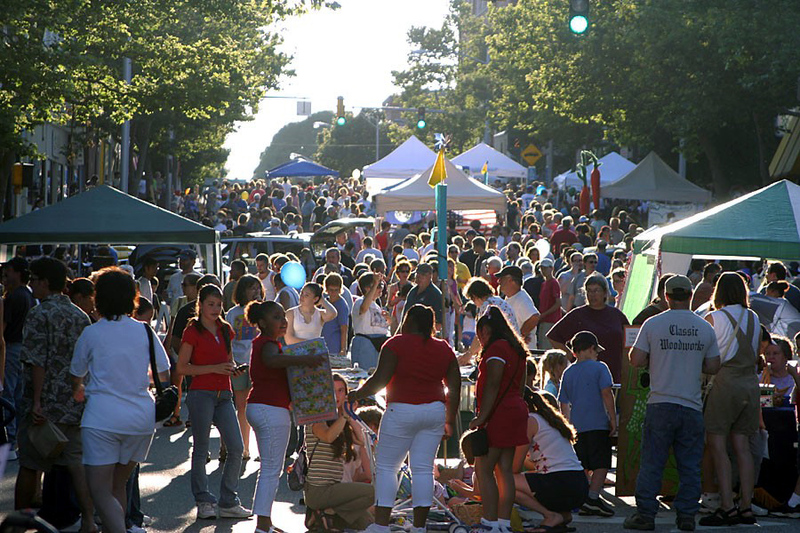 From May to October, on the 3rd Thursday of each month, four blocks of Main St. are closed to vehicular traffic for the evening & filled with festival-goers. Thousands of pedestrians browse merchandise within a background of musical, theatrical, visual & olfactory delights. There are clowns and bands and a giant frog to entertain you as you meander through the fest. Local and regional vendors set tables in the street showcasing the wealth of goods produced in CT. This area is rich in musical talent. 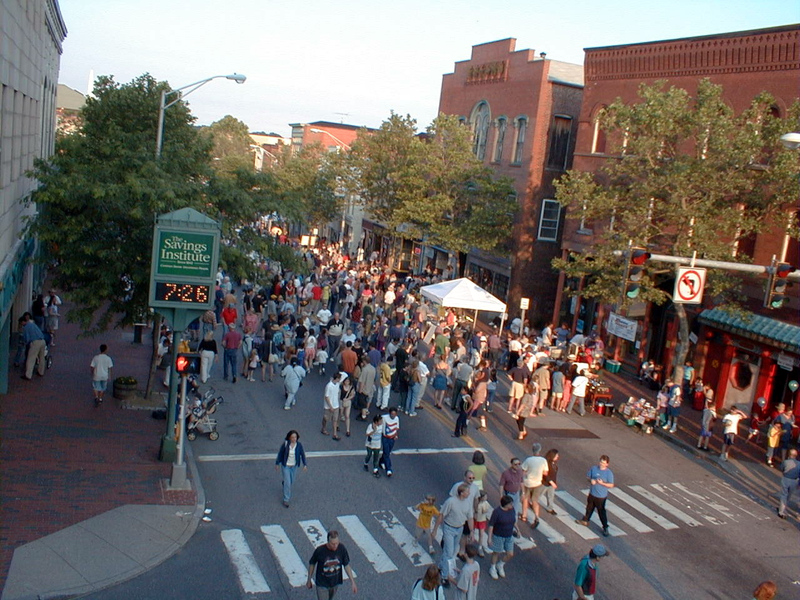 Five stages, placed along Main Street, have continuous performances ranging from rhythm and blues to Latin jazz to folk rock to African drumming. The music is interspersed with performances by dance troupes, poets and puppeteers. Street performers and childrenÍs events are strategically placed throughout Main Street so a new adventure is always unfolding. One block may hold the Bounce Room and another face painting. Kids of all ages will have something special to enjoy. Our cultural diversity brings wonderful food to the festival. ThereÍs authentic Thai, Indian, Mexican, Syrian, Puerto Rican, Italian, and Ukrainian food vendors providing gastronomic delights from around the world. And thereÍs old-fashioned ice cream floats for dessert! Main Street Willimantic is an old mill town and was the center of commerce in Eastern CT in the late 1800's. Many people from all over the region come and participate in the Festival. The Festival is accessible by foot, transit, and auto. Visually, the 5,000 to 6,000 people who come each Third Thursday marvel at the local architecture and the integration of the festival tents, stages and vendors with the street. The Festival committee has a subcommittee dedicated to "Street Scenes" which work to integrate the festival into the downtown environment. The closure of four blocks on our busiest street and the creation of this festival with music, food, vendors and groups have made a very positive impression of a once depressed downtown business environment. The space is 100% pedestrian during the festival from 6pm to 9pm. Security has not been an issue and everyone feels safe. The Festival has attracted many nationalities by its food booths and ethnic music and is truly a diverse cultural experience. The street has been full with upwards of 6,000 people at a time. 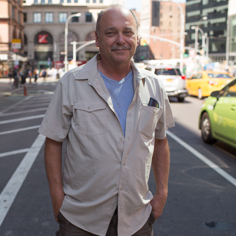 The committee is considering extending the closing of streets for one more block. We have young children in strollers, kids, teenagers, adults and senior citizens attend. The Street Festival has become a very social place, and while many people come to see people they haven't seen in a while, many also come to mingle with others. We see both groups and single people interacting. Much local pride has gone into the event and people who have not come to downtown in awhile are impressed with the event and Main Street. We have a local University conducting a survey and recent data indicates that 48% of the attendants are town residents, with the remaining 52% coming from nearby towns here in Eastern CT.